I didn’t know much about Habitat before Wednesday, having never participated in a project myself, however, many members of the Sea Dogs staff had, and we were all pleased to be giving back and be out of the office together. I encourage all businesses and individuals-especially those with special skills- to look into participating in a Habitat project. Their program is not only an excellent assistance to many families and individuals in need of a helping hand, but it is also a gateway to creating future independence supported by education and an understanding of the home ownership process. While the Sea Dogs staff cannot boast any “special” carpentry or finishing skills, we do specialize in hard work, a concept that is not foreign to any of us. We arrived at the home around 9am and were greeted by an AmeriCorps volunteer and the construction manager on site. 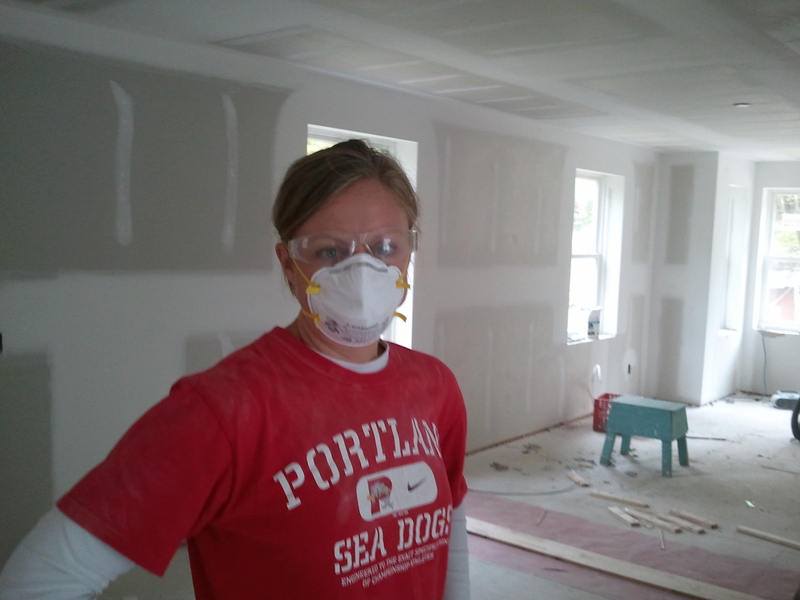 After a quick demo and a few self-deprecating jokes by our staff, we set to work sanding the newly dry walled living room, upstairs and stairwells of the home. Sanding was not an easy or tidy job. After a quick inspection (and a few necessary touch ups per the request of our on-site manager) we got started on the painting. After a break for lunch, followed by more self-deprecating jokes, we began the painting process. Painting was rewarding, and a shoulder work out. Never again will I look at a finished room the same way. We painted the ceilings and the walls, with some staffers working with small brushes to do the “edging”. I’m not sure which was harder work, the sanding or the painting. What I liked about the painting was that you could see your progress throughout the afternoon. Your boss is good at a lot of things, but painting is not one of them. Around 10:30am your breath really starts to stink, as you discover while wearing your mandated safety mask. The day was a success; everyone came back with all of the digits with which they arrived, we accomplished something tangible that helps members of our community and we had a great time outside of the stadium as a staff. The Habitat and AmeriCorps folks were organized, engaging and working right alongside of us all day. It was a positive experience for all of the staff and we are looking forward to doing it again soon.The Dogs are back home today with a quick three-day series, so get your fix in this weekend before they leave. The weather looks to be spectacular! Tonight’s game is at 6pm with a fireworks show scheduled for after (fire works, people!). Saturday’s game is at 1pm as is Sunday’s game. You all know how I feel about day baseball (greatest invention in sports) but if that isn’t enough to bring you here, then you should know The Kastaways will be performing in the front plaza on Saturday afternoon and after Sunday’s game all kids are invited to run the bases of Hadlock Field after the game thanks to the kind car folks at Prime Motor Group. Hope to see all of you at Hadlock Field this weekend getting your fix of baseball and vitamin D!